Dr. Adams is an excellent dentist! He has been our family dentist since moving to CA in 2003. Dr. Adams office is a family friendly environment and he is very knowledgeable in his field. I have had braces removed (not placed by Dr. Adams), several fillings and root canals. My procedures have been successful with minimal or no pain. Brenda, the secretary is very friendly. The dental assistants are very nice and make you feel comfortable and welcome. Dr. Adam's dental work is amazing! He even warmed my coffee in the microwave after my procedure and called to check on me the day following my procedure to make sure that I was doing fine. What dentist warms coffee for a patient?? Dr. Adams and his staff are more like a family! They really are the best in town! I would recommend Dr. Adams and his staff to any individual or family! There are times when I have not had enough insurance to cover procedures and Dr. Adams worked with me resulting in me having to only make a small payment so that I was able to get dental work completed. Me and my entire family have enjoyed having Dr. Adams as our family dentist. 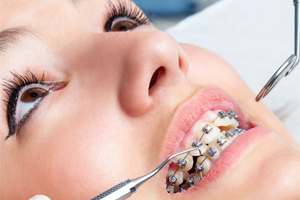 Full mouth orthodontic treatment can be provided using conventional braces. This standard treatment has been used for many years. You may decide on full mouth or partial treatment just to straighten a few crooked teeth. Many adults, that had ortho treatment as children, have relapsed and just need an orthodontic "touch-up" that can be completed in just a few weeks. If you don’t like the idea of wearing braces again, even for a short time, then you need to read about the Invisalign orthodontic system. Invisalign is an amazing system that allows patients to straighten their teeth like they have always wanted, without the unsightly metal brackets and wires glued onto the teeth. Using a series of clear aligner trays, patients can gently move their dental arch into alignment. These trays are comfortable, discreet, and easy to use, allowing teenagers and adults to smile more, laugh more, and enjoy their treatment! Invisalign uses several aligner trays which are switched out every two weeks to reposition the teeth slowly. This method has been proven highly effective in realigning crooked teeth and helping to straighten the dental arch. It does require patients to be compliant with treatment, and wear their trays all day and night for the best results. The trays are removed for eating, drinking, brushing, and flossing. This particular method of orthodontia is used to address mild to moderate misalignment of the dental arch or bite. It is safe, effective, and widely available at practices in the Sacramento, California area such as our practice. 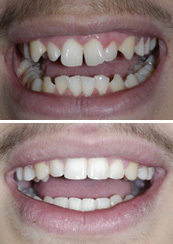 Patients have seen dramatic changes to their smile and enjoy the benefits of a straighter, better-aligned smile. If you are interested in Drs. Kosta and Kirsten Adams educating you and your family on the benefits of Invisalign orthodontics, call their practice today. At our office, we offer free consultation visits and can help you determine if Invisalign orthodontics can realign your smile quickly and easily, helping you avoid the need for traditional orthodontic braces.